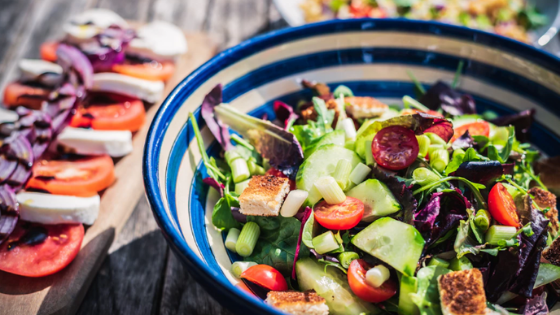 Here are 3 Spring Salads to try for those breezy evening meals! This twist on classic chef's salad brings salmon, olives and balsamic dressing to the table. Simply prepare a tossed salad out of freshly picked spring greens and top with halved boiled eggs, cherry tomatoes, pitted kalamata olives, and a can of salmon. Finish it off with a couple of tablespoons of the balsamic dressing and serve with a nicely chilled glass of Rosato wine. This healthy take on traditional Caesar salad uses grilled chicken, chopped sweet onion, baby red potatoes cut in half, torn Romaine lettuce, and freshly grated Parmesan cheese. Combine chunks of grilled chicken in a large bowl with a couple of tablespoons of creamy Caesar salad dressing and the chopped onions. Add the potatoes with another tablespoon of the dressing, and add a finishing touch of a shake or two of coarsely ground cracked black pepper. This salad pairs well with a nice tall glass of light, cold Pilsner beer. Lamb is quintessential springtime fare that can easily be enjoyed as a salad ingredient rather instead of as chops or a roast. You'll need fresh baby lettuce, curly endives, sun-dried tomatoes, freshly grated Parmesan cheese, arugula, Dijon mustard vinaigrette, finely chopped thyme, and roasted lamb. Prepare the salad out of the green ingredients and toss lightly with the vinaigrette. Add the sun-dried tomatoes and the lamb chunks. Dust the salad lightly with sprinkles of white pepper. This one is hearty enough to stand up to being served with a good red Bordeaux. Our apartments feature gourmet kitchens equipped with stainless steel appliances. Please don't hesitate to reach out to us for more information on enjoying life in beautiful Atlanta.